Iran has mixed feelings and conflicting interests in the Syrian crisis. Tehran has a strategic interest in opposing chemical weapons due to its own horrific experience during the 1980-1988 war with Iraq. For years, President Saddam Hussein’s military used chemical weapons that killed thousands of Iranian soldiers. So Iran actually shares interests with the United States, European nations and the Arab League in opposing any use of chemical weapons. But the Islamic Republic also has compelling reasons to continue supporting Damascus. The Syrian regime is Iran’s closest ally in the Middle East and the geographic link to its Hezbollah partners in Lebanon. As a result, Tehran vehemently opposes U.S. intervention or any action that might change the military balance against President Bashar Assad. • Iran opposes the use of chemical weapons based on its own experience. Iran is a signatory to the Chemical Weapons Convention while Syria is not. • Tehran wants to reduce tensions with the West in order to lift sanctions. • Iran is reportedly spending millions of dollars per month to support the Assad regime while its own economy suffers from sanctions, unemployment and inflation. • The United States has sanctioned Iran’s elite Revolutionary Guards Quds Force for helping Syria suppress anti-government protests. • Tehran opposes military intervention by outside powers in the Middle East. • Syria is Iran’s closest ally in the region and part of the “resistance front” against Israel. • Syria is a key conduit for transferring arms and supplies to Lebanon-based Hezbollah, which deters against an Israeli strike on Iran’s nuclear facilities. • Iran has invested millions of dollars in Syria’s economy and provided training to its army. • Syrian rebels are overwhelmingly Sunni and are hostile to Shiite Iran. The Iran-Syria alliance is more than a marriage of convenience. Tehran and Damascus have common geopolitical, security, and economic interests. Syria was one of only two Arab nations (the other being Libya) to support Iran’s fight against Saddam Hussein, and it was an important conduit for weapons to an isolated Iran. Furthermore, Hafez Assad, Bashar’s father, allowed Iran to help create Hezbollah, the Shiite political movement in Lebanon. Its militia, trained by Iran’s Revolutionary Guards, has been an effective tool against Syria’s archenemy, Israel. Relations between Tehran and Damascus have been rocky at times. Hafez Assad clashed with Hezbollah in Lebanon and was wary of too much Iranian involvement in his neighborhood. But his death in 2000 reinvigorated the Iran-Syria alliance. 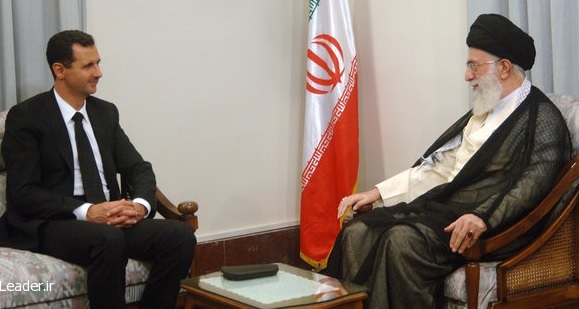 Bashar Assad (left, with Supreme Leader Khamenei) has been much more enthusiastic about Iranian support, especially since Hezbollah’s “victorious” 2006 conflict with Israel. In the last decade, Iran’s Revolutionary Guards have trained, equipped, and at times even directed Syria’s security and military forces. Hundreds of thousands of Iranian pilgrims and tourists visited Syria before its civil war, and Iranian companies made significant investments in the Syrian economy. Fundamentalist figures within the Guards view Syria as the “front line” of Iranian resistance against Israel and the United States. Without Syria, Iran would not be able to supply Hezbollah effectively, limiting its ability to help its ally in the event of a war with Israel. Hezbollah wields thousands of rockets able to strike Israel, providing Iran deterrence against Israel— especially if Tel Aviv chose to strike Iran’s nuclear facilities. A weakened Hezbollah would directly impact Iran’s national security. Syria’s loss could also tip the balance in Iran’s rivalry with Saudi Arabia, making the Wahhabi kingdom one of the most influential powers in the Middle East. In the run up to a U.S. decision on military action against Syria, Iranian leaders appeared divided. Supreme Leader Ayatollah Ali Khamenei and hardline lawmakers reacted with alarm to possible U.S. strikes against the Assad regime. And Revolutionary Guards commanders threatened to retaliate against U.S. interests. The hardliners clearly viewed the Assad regime as an asset worth defending as of September 2013. But President Hassan Rouhani, Foreign Minister Mohammad Javad Zarif and former President Ali Akbar Hashemi Rafsanjani adopted a more critical line on Syria. “We believe that the government in Syria has made grave mistakes that have, unfortunately, paved the way for the situation in the country to be abused,” Zarif told a local publication in September 2013. Rafsanjani, still an influential political figure, reportedly said that the Syrian government gassed its own people. This was a clear breach of official Iranian policy, which has blamed the predominantly Sunni rebels. Rafsanjani’s words suggested that he viewed unconditional support for Assad as a losing strategy. His remark also earned a rebuke from Khamenei, who warned Iranian officials against crossing the “principles and red lines” of the Islamic Republic. Khamenei’s message may have been intended for Rouhani’s government, which is closely aligned with Rafsanjani and seems to increasingly view the Syrian regime as a liability. Regardless, a significant section of Iran’s political elite could be amenable to engaging the United States on Syria. Both sides have a common interest: preventing Sunni extremists from coming to power in Damascus. Iran and the United States also prefer a negotiated settlement over military intervention to solve the crisis. Tehran might need to be included in a settlement given its influence in Syria. Negotiating with Iran on Syria could ultimately help America’s greater goal of a diplomatic breakthrough, not only on Syria but Tehran’s nuclear program as well.